Brussels Airport is auctioning off most of its art collection, and the works are currently on view at Campo & Campo gallery in Antwerp. There are 90 works going under the hammer, and there is no minimum start price on any single piece. The airport’s art-buying policy was to acquire works created only by local artists. Dozens of artists are represented, including Philip Aguirre Y Otegui, Pierre Alechinsky, Panamarenko and Johan Baudart. Almost all of it must go because infrastructure works over the year has made keeping it all impossible. Most of the pieces – from painting to photography to large sculptures – have been in storage for months or years. 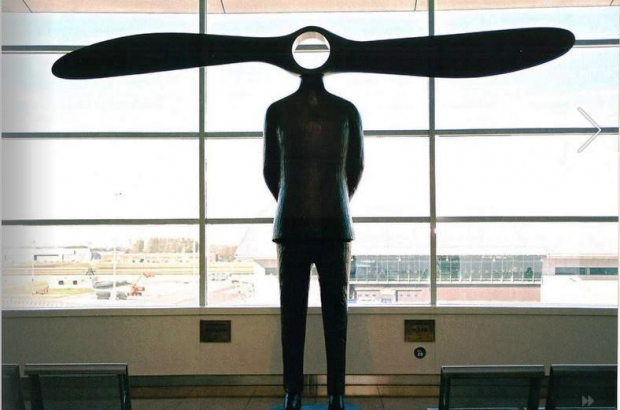 “We want to give the art back to society and give the pieces a space; they deserve to be seen,” said airport spokesperson Anke Fransen. The auction is open to the public, and the airport is donating the proceeds to charity. Even those not interested in bidding on something are invited to come see all the works in one place. They were previously spread out across the entire airport, in various terminals and spaces, so it’s the first and last chance to see them all together. The auction takes place at the gallery next Sunday, 25 March. A catalogue in English, French and Dutch on all the pieces and the artists can be consulted online.